For some kids sometimes a kiss is all they need to heal a boo-boo. My kids prefer band-aids even when there is no blood in sight. Ouchies make those boo-boos all better with fun and funky designs. Ouchies was started by a dad who wanted to add some fun to his daugh ter’s bumps and bruises. Scouring the stores and markets left him empty-handed so with the help of his lovely wife they concocted Ouchies. Girl Bands, Boy Bands and Make Your Own-Ages are the 3 styles to choose from from Ouchies. Each comes in a cool tin with 20 bandages inside with designs such as Surfer, Dragon and Camo. 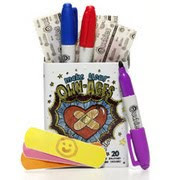 Even cooler are the Make Your Own-Ages that come with blank bandages and 3 markers so kids and adults alike can design their own wound covering. Shae gets the littlest scratch or redness and immediately asks for a bandaid. She hasn’t been digging the standard Blues Clues bandaids lately so I thought she would love these designs. Join the fight and become a member of People Against Boring Bandages. Take a stand against the dull and beige bandages we are so used to. Dad’s Perspective: Shaun loves the rocker tattoo style of these bandaids, they are much cooler than Spongebob or Scooby Doo. LookWhatMomFound…and Dad too! readers are getting the chance to win one of three gift sets(1 tin of each style) from Ouchies. Visit Ouchies Online and tell me who would love these funky fresh bandages. Your entries must follow the rules or they won’t be eligible for prizes. This contest ends 11:59 pm, Sunday, November 15, 2009. The winners will be emailed and will have 48 hours to claim their prize. This contest is open to US residents only. 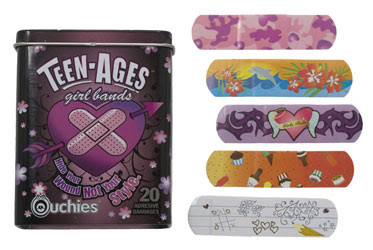 My daughter would love these bandages-she is really into wearing band-aides right now-even for the tiniest scratch! LOL! my husband and I would both love these! we're kids at heart. We'd use them for our daughter too. I would like them. I get bored with the plain ones. My 15 yr old would definitely rock this band aides. I think these are better for more than kids and teens! My 30-year old boyfriend would LOVE them! These would be great for my son and nieces. Thansk for the chance. granddaughter will love gumma for this. My 18 yr old college going daughter would wear them as a fashion statement! hahaha Both my boys would be in heaven with the Boy Bands. I love that the bones spell out "poison" on the boy bandages. I also joined their P.A.B.B. group!! I subscribe to you in bloglines. I really think that all six of my kids would like these. Cool designs! How fun are these!?! My daughters would look stylin' in them! My daughter would love these. They're so pretty. My daughter would love the Teen-Ages Girl pack. Thank for the review and giveaway! Not only would my boys love these, but they have some great designs for my tween nieces as well. My son and niece would love these. They're both 5 and require band-aids for every little thing too! I entered your Dreamsacks giveaway. As a mom of a boy, im sure i will be going through lots of bandaids. ok let's be honest *I* would love these bandages! We have 6 children ages 20 down to 18 months so i think these would please everyone, even Daddy! Both my 3 year old daughter and husband would love these. ok… I have 3 boys blessed with my clumsy jeans… but I gotta admit… who would love these?? Me!! The boys (esp. my youngest) will think they're great!! But I will LOVE them!! they look great, AND will help take their mind off the offending booboo! My neices would love these when they come round they always get cuts and scrapes! My kid is accident prone!! I could use these. Thanks for the chance. My four siblings would love this. My nieces would love these, especially the ones with the notepaper and little hearts. Very cute. My daughter would love these. Thanks! to be honest, I believe my whole family would enjoy these. I know I do. I love the teen bandage cause it comes in cool designs. My niece would love these…especially the design your own ones! I would use these for my family!! Entered the Citiblocs 52 or 54 piece wooden block set giveaway. Follow both on Twitter & tweeted @ http://twitter.com/Naddez/status/5728475282. My grandson would love these funky fresh bandages. my son would love these. he is always needing a bandaide. I could totally see one of these on the boyfriends head when he cuts himself shaving… sorry honey I only have the pretty little girly bandaids! My daughter would love to have these!! These are so neat. My 7 & 9 year old sons and 12 year old daughter would all love these bandages! I'm also a fan of LookWhatMomFound and Ouchies on Facebook user Lisa Garner. Me! I would love these…they are SO cool! I fanned you and them on Facebook under Tofu Fairy. I would love to win these for my niece and nephew, both are 16 years old. Blue make your own bandages for my nephew. My granddaughter would love these bandages! Thanks for hosting this giveaway! Awesome!